By Jeff Aranow: ESPN commentator and former two division world champion Tim Bradley is picking IBF middleweight champion Daniel Jacobs (35-2, 29 KOs) to defeat WBA/WBC 160 lb champion Saul Canelo Alvarez (51-1-2, 35 KOs) on May 4. 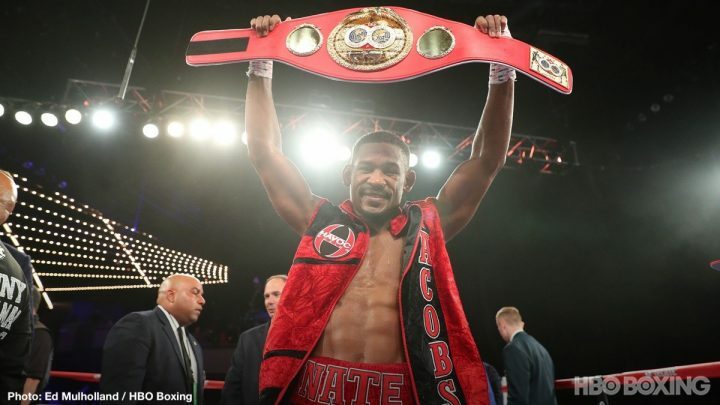 Jacobs, 32 will be walking into the lion’s den on May 4 in facing Canelo, 28, at the T-Mobile Arena in Las Vegas, Nevada. This place has proven to be a very difficult one for Canelo’s opponents to beat him. Whether there’s a jinx on the place that makes it impossible for Canelo’s opponents to beat him when he’s fighting there is unknown. So far, Canelo has never been beaten at the T-Mobile, and you can make a strong argument that he deserved losses in the last two times he’s fought there against Gennady Golovkin. As long as Jacobs realizes what he’s up against in fighting Canelo at that venue, he might be okay. It still won’t be easy though for Jacobs. Bradley likes the 5’11 1/2″ Jacobs to win by staying at range, and boxing the shorter 5’8″ Canelo. That’s how Floyd Mayweather Jr. beat Canelo in 2013, and he’s the same height as him at 5’8″. Mayweather had the longer reach, and the far quicker hands. He made sure that he stuck a powerful jab in the face of Canelo for 12 rounds, and didn’t give him a chance to throw his counters that he needed to for him to have a chance of winning. That fight was very one-sided in Mayweather’s favor. Never the less, one judge still had the fight scored a draw. It’s not a Canelo fight if there isn’t controversy involved. He somehow is able to get scores in his favor that often make little sense. It was a welcome relief that Canelo was able to knockout his last opponent Rocky Fielding in order to finally be involved in a fight that didn’t have questionable scoring. “He’s the taller more rangier guy,” Tim Bradley said to esnewsreporting about Jacobs being taller than Canelo. ”Canelo’s a beast. I get it. He beat GGG. But I like Danny Jacobs. I like his speed. I think he can make things difficult with his legs, and his hand speed and his decent power against Canelo. It was a close fight [Golovkin vs. Jacobs], but GGG got the knockdown earlier on, and I think that was the deciding factor in the fight. But I liked how Danny Jacobs got up and showed some grit and bounced back in that fight to come back to lose a close decision. I think Danny Jacobs has enough in the tool box to win,” Bradley said. Jacobs will likely be staying on the move to keep Canelo from being able to walk him down and land his hard shots to the body the way he did against Golovkin last September. Golovkin was retreating when Canelo was coming at him, but he would stop before he got to the ropes. That’s where Canelo was able to land big shots on him. Of course, Golovkin always answered back with big shots in return, and he made things very difficult for Canelo. If Golovkin had good wheels, he likely would have moved more around the ring so that he could jab him all night from the outside, but he couldn’t do that. GGG doesn’t move well enough to escape pressure. Jacobs can do that if he wants to, and he might give Canelo fits if he’s able to stick a jab in his face all night, and then move away when he tries to close the distance. Canelo has to get close enough to land his shots, because his arms are too short for him to land power shots or even his jab from the outside. The only way that Canelo lands anything is if Jacobs is trapped against the ropes, or if he throws a power shot that leaves him open to a counter. Jacobs will throw power shots from time to time, but not if he’s having a lot of success with his jab. ”If Jacobs stays away from Canelo like Floyd [Mayweather] did by box, box and box, where him down and tear him down, I give Jacobs a chance,” said Teofimo Lopez’s dad to esnewsreporting in saying Jacobs can beat Canelo if he boxes him. A lot of boxing fans and writers are picking Canelo to beat Jacobs due to the improvement that he showed in his rematch against Golovkin last September. The only thing that Canelo did in the rematch that was different from the first fight with Triple G in September 2017 was that he came forward and pressured. GGG fought like he wasn’t expecting pressure, and let Canelo get close to him to deliver his power shots. Canelo’s superior inside skills and hand speed enabled him to get the better of Golovkin in a lot of rounds. However, in the second half of the fight, Canelo wore down and was getting out-boxed by GGG. Canelo was hurt in the 10th and 11th rounds by big shots from GGG. Canelo came on in the 12th in a round that could have gone either way. Luckily for Canelo, the judges gave him the 12th, otherwise the fight would have ended up in a draw, which you can argue is what it should have been. Golovkin appeared to do enough to get the draw, but not with these judges. That would be interesting to see the 5’8″ Teofimo Lopez winning up at middleweight one day. He might need to grow a little bit before he makes that move up to middleweight, because he’s not very tall for that weight class and his hand speed isn’t quite fast enough to make up for his lack of height for the 160 lb division Canelo gets away with fighting at middleweight because of his hand speed. Once Canelo starts losing his speed, he’s going to have problems in that weight class.